Based out of Houston, Texas, Michael Hutchins is a personal trainer who has been writing health and fitness-related articles since 1995. His articles have been featured in "Houston Health & Fitness Magazine." Hutchins has a Bachelor of Arts in speech arts from Hofstra University, Hempstead, N.Y. If you are trying to make the cut at basketball tryouts you need to prepare both mentally and physically. By practicing the fundamentals, and coming to the tryouts in top condition, you will have the confidence to impress the coaches. Take the opportunity to apply the fundamentals that you are practicing, while competing with other players. 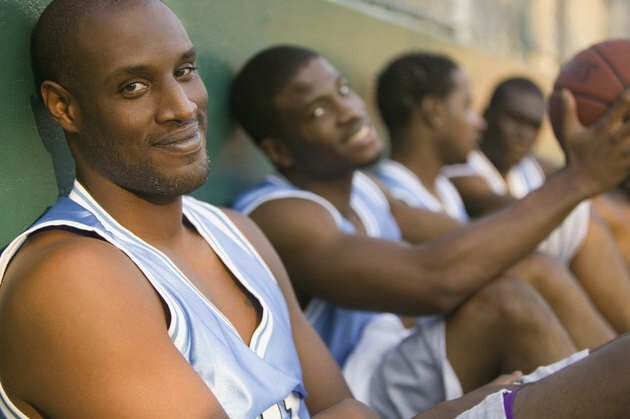 Consult with your health care provider regarding taking a physical prior to basketball season. Perform conditioning drills every other day until tryouts. The coaches are going to be evaluating your fitness level and the amount of effort you are able to give when you play. Basketball is a game that requires aerobic endurance and anaerobic bursts of energy. Warm up by jogging slowly for eight to 10 minutes. Alternate sprinting for 40 yards with assuming a defensive stance and sliding laterally for 40 yards. Give yourself enough rest while you are alternating to get your wind back. Your goal is to alternate these drills for between 20 to 25 minutes. Find at least one practice partner. Practice partners can motivate each other to practice harder and can also evaluate the others progress. Practice partners can also help with shooting drills by rebounding for each other and passing the ball for the next shot. To elevate your skills, find a practice partner who has more advanced skills than you. Practice the skills required of the position you are most likely to play. If you are a guard, practice your three-point shooting, shooting off the dribble, and shooting from different angles on the court. Practice ball handling skills such as a change of speed dribble, crossover dribble, and a spin dribble. If you play close to the basket, practice a jump hook, drop step to the basket, and a turnaround jump shot. Always have your practice partner play non-aggressive defense while you shoot. Practice your skills every other day until tryouts. Play half court games with up to three players on each team. Playing one-on-one is a good way to develop a quick first step. To improve your defense, play one-on-one with a rule that the defensive player must stop the offensive player from scoring before the ball changes possession. If possible, play against players who have greater skills than you. To improve your free throw shooting, shoot foul shots when a player is fouled in a game of one on one. Rest for 24 to 48 hours prior to your tryouts, so you have ample energy to perform. Start hydrating the night before your tryouts and stay well-hydrated during the day of your tryouts. Have a nourishing meal at least two hours before your tryout. Basketball-Tips-And-Training.com: Tips For Basketball Tryouts: Make An Impression!